Can you visit Chernobyl today? What are Chernobyl tours like? And are Chernobyl and Pripyat tours safe? What does a Chernobyl tour cost? I’ll answer all those questions inside this Chernobyl tour review. First, a brief summary: despite what you might expect, it is actually quite easy — and safe — to go the Chernobyl exclusion zone today. Starting from Kiev, Ukraine, Chernobyl and Pripyat tours will take you to see the infamously failed reactor, explore haunting abandoned buildings in Pripyat town, and hopefully learn a bit about this critical moment in world history. 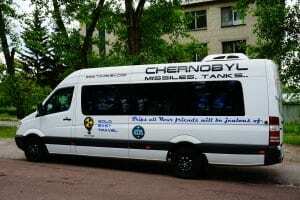 Many people do not know that it is possible to visit Chernobyl, and there aren’t a lot of candid Chernobyl tour reviews out there, so I wrote up this brief summary of what it’s like to take one of the many Chernobyl tours on offer in Kiev. In short, though the Chernobyl tour cost isn’t cheap, Chernobyl and Pripyat tours are utterly fascinating, eerie, and thought-provoking. Read on for my full review of what it is like to go to Chernobyl today. In a bit of dark irony, the Chernobyl accident started with a safety test. On April 26, 1986, engineers shut down power to Reactor 4 at the Chernobyl Nuclear Power Plant near Pripyat, Ukraine. This was done to simulate conditions during a power blackout. But a number of factors led to a disastrous steam explosion and, later, a graphite fire that vaulted fission products high into the atmosphere for almost ten days. The accident generated a massive amount of nuclear fallout across all of Europe. Indeed, the Soviet Union didn’t even acknowledge the accident until its radioactive fallout was detected in Sweden. 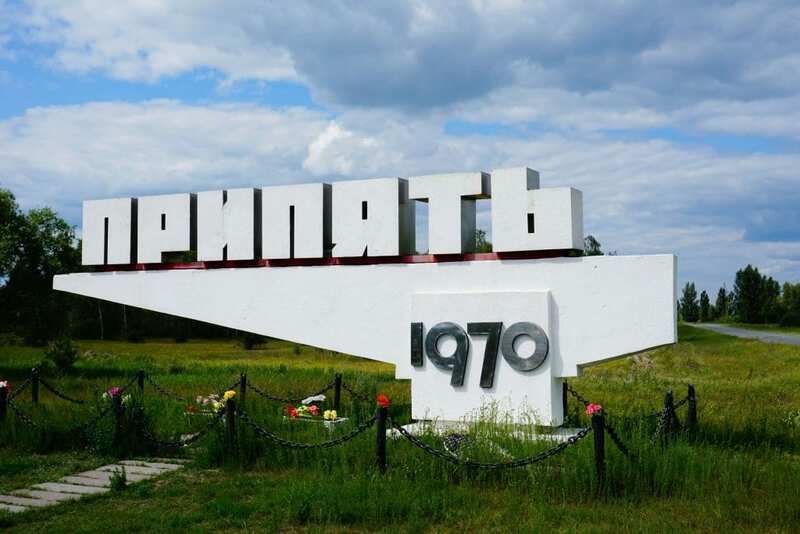 36 hours after the accident, the Soviets completely evacuated the nearly 50,000 people living in nearby Pripyat town. Residents were able to bring a suitcase or so at most, but otherwise completely abandoned Pripyat. Through a months-long effort that resulted in many deaths, the fire was put out and the reactor covered in a large sarcophagus meant to contain it for 30 years (a new one is being constructed today). The death toll from Chernobyl is highly controversial and difficult to pin down. 31 people died as a direct result of the accident, but thousands more — perhaps 50,000 or more — were killed by cancer and other diseases associated with the radioactive fallout. Some have argued that the Chernobyl accident left at least something of a positive legacy in that it showed the world the true destructive force of nuclear weapons. It is also arguable that the enormous cost associated with cleaning up the accident helped contribute to the downfall of the USSR. Today Chernobyl is surrounded by a large exclusion zone thirty kilometers in radius (with a smaller more tightly controlled exclusion zone at a ten kilometer radius). For foreign tourists, the only practical way to visit the Chernobyl exclusion zone is as part of a guided Chernobyl tours from Kiev. The tours leave from central Kiev and can be pricey: The Chernobyl tour cost is between $100-$300 per person. Book in advance for a better deal and to ensure the authorities have time to run security checks. I booked with Solo East Travel, which I thought did a great job on the tour. How long does a Chernobyl tour last? Tours leave around 8 AM in the morning and last about 12 hours. 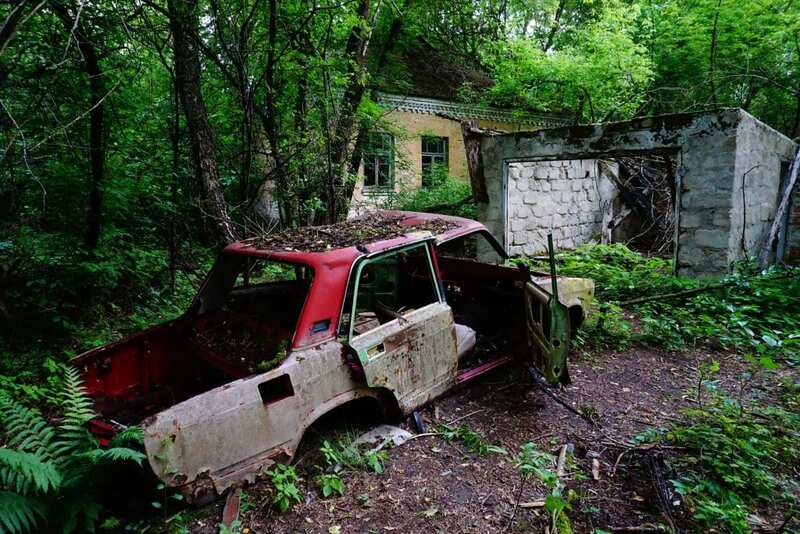 The drive to the Chernobyl exclusion zone is about two hours, but you’ll pass the time watching documentaries recounting the history of the Chernobyl accident. Lunch is served midway through the tour (don’t worry – the food is trucked in from Kiev). Can You Visit Chernobyl Safely Today? Or so they say, anyway. Supposedly Chernobyl tours expose you to a fraction of the radiation you would receive on a transatlantic flight. We had Geiger counters and the levels spiked a few times when we went through hot spots where radiation levels were still high. It’s a bit freaky to hear the counters suddenly beeping loudly. But radiation is everywhere and, if you do some basic math on your exposure time, you realize that you really aren’t receiving much more radiation than you do in an average day — so long as you follow the required safety measures described below. Pripyat and the exclusion zone are hauntingly beautiful. Vegetation has grown essentially everywhere, as Mother Nature slowly reclaims the abandoned buildings in the area. The whole scene is very haunting and reminded me a bit of the pictures I took in Abkhazia. In the immediate aftermath of the accident, Soviet soldiers were deployed in squads to kill the dogs and cats living in the exclusion zone, lest they track radiation outside the zone. But today there are actually a lot of animals at Chernobyl. You’re likely to see many dogs and cats and, if you are really lucky, you might spot one of the 100 or so wolves that live in the zone. Near the Reactor #4 you’ll find catfish that can grow to over 3 meters long! There is actually a surprising amount of human activity inside Chernobyl today, thanks to the many governmental employees charged with caring for the area. There is a convenience store where you can pick up snacks, several governmental buildings, and even a hotel complete with a small bar. What do you do during tours of Chernobyl? All Chernobyl tours will involve exploring the many abandoned buildings within the exclusion zone, the highlights of which are in Pripyat town. We visited an abandoned school, a gym with a swimming pool, a grocery store, and one of the large Soviet-style apartment buildings in the Priypat town. 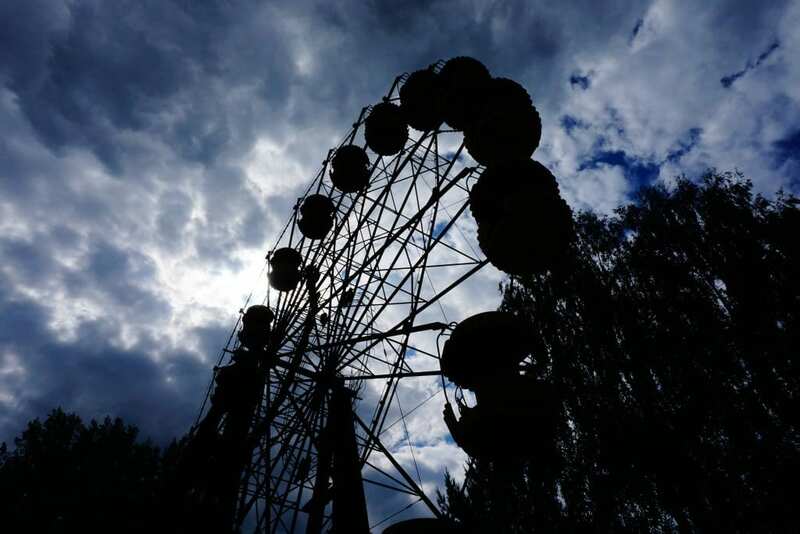 There is also an abandoned amusement park with a haunting Ferris wheel that has become of a symbol for the Chernobyl tragedy. Though it is best not to touch anything, I was surprised at how much freedom you are given to roam around and in the abandoned buildings within Pripyat. We also visited this enormous sensor built by the Soviets as a warning system against missile attack. Lastly, you of course visit the famous reactor itself (although you do not go inside the sarcophagus, obviously). Surprisingly, the radiation levels near the reactor are actually much less than elsewhere in the exclusion zone. You won’t wear any special equipment while visiting Chernobyl — there are no masks or special suits involved. You do need to wear long sleeves and pants within the inner exclusion zone. 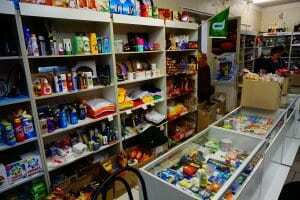 The most important thing is not to take any souvenirs home from Chernobyl. There is random stuff everywhere in Priypat — books, newspapers, toys, etc. 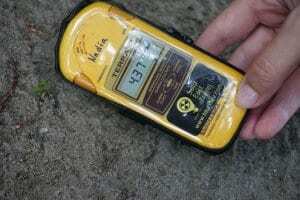 It might be tempting to snag one of these as a keepsake, and some people have been known to do this, but it is really quite dangerous as some objects still contain high levels of radiation. You can also rent a Geiger counter if you are worried. For the vast majority of my tour, radiation levels were actually less than what they were in central Kiev where the tour departed (this is because marble and granite buildings can give off ambient radiation). At the end of the tour you will be scanned with two separate devices to check for radiation. Everyone in my group was cleared, but apparently, it does sometimes happen than an object might have come in contact with radioactive dust. If that happens, they’ll try to clean whatever item is tripping the sensor or, in a worse case scenario, confiscate it from you. My guide did tell me that she once had a tourist who sat on the ground, came in contact with radiation, and then had to ride back to Kiev without her pants! As a final note, I was a bit concerned by the cavalier attitude some people take on Chernobyl tours. Many tour minibuses are decorated with cartoon-like radiation symbols, souvenir T-shirts are sold from a vending machine at lunch, and I saw many people taking selfies. Our entire tour even began with the song “Radioactive” by Imagine Dragons blasting out of the speakers. I suppose this is part of the new “dark tourism” trend. 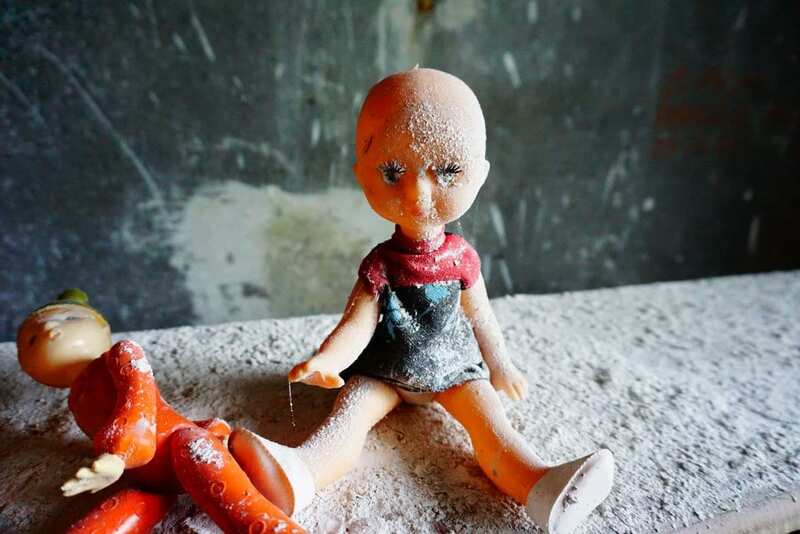 Still, parts of the Chernobyl tour seemed more than a little macabre. The Chernobyl accident was an incredibly tragic and painful incident. Thousands of people — probably tens of thousands of people — died fighting to contain the reactor and from radiation during the clean-up process. Many more continue to suffer from illnesses associated with radiation poisoning. All of which is to say that, while I think a visit to Chernobyl is fascinating and well worth it, I also think it is important to do so respectfully given the seriousness of the tragedy which it represents. Summary of Chernobyl Tours Review: Was it Worth it? Though expensive, I thought that taking a tour of Chernobyl and Pripyat was one of the more fascinating experiences I’ve had in Europe. You really come face to face with the haunting reality of the accident, in a very visual and graphic way. If you’re already in Kiev, which is a wonderful city to visit anyway, I would strongly suggest visiting Chernobyl. What do you think? 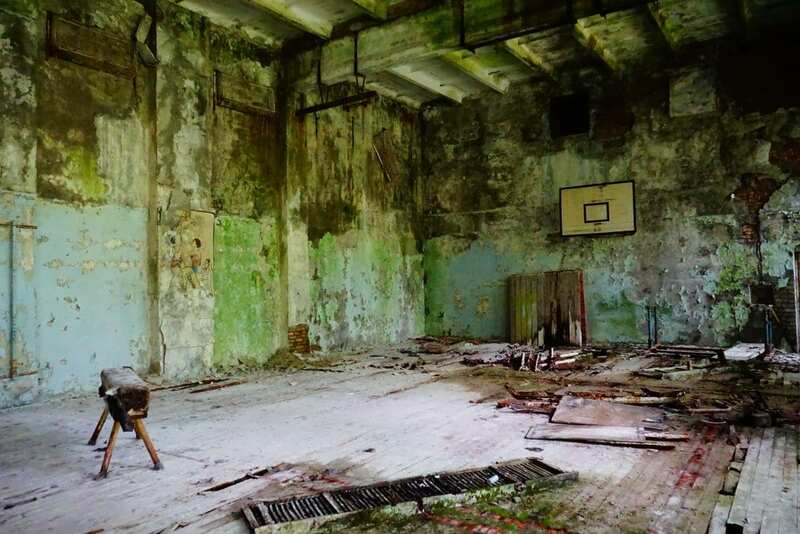 Would you go on Chernobyl tours (or have you been)? 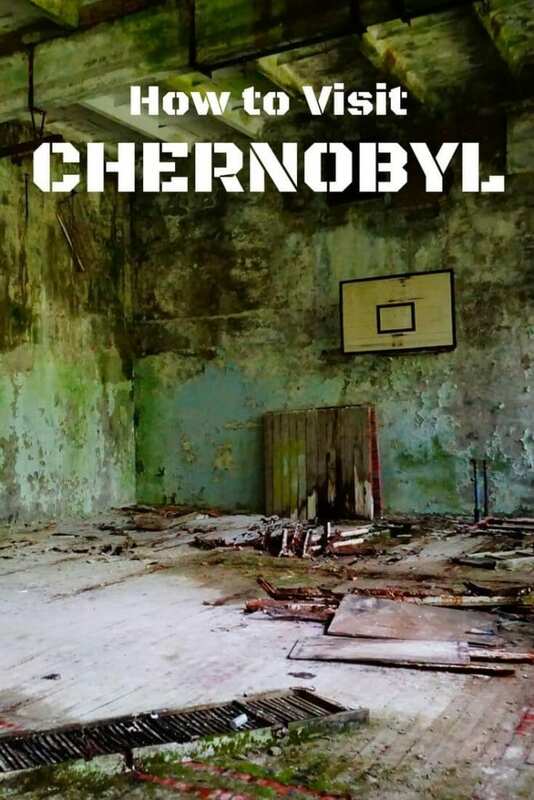 Let me know your Chernobyl tour reviews in the comments. Previous Post Backpacking Iran: What’s it like? 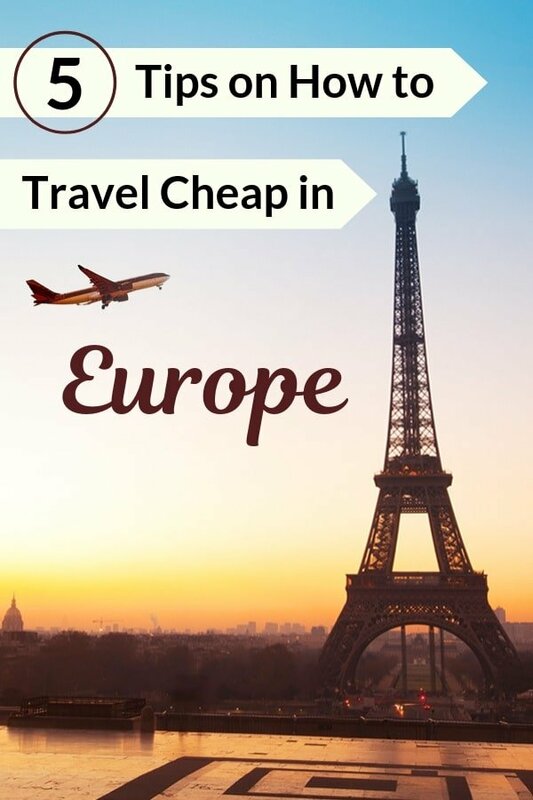 Next Post How to Travel the World Cheaply: The Single Best Tip! Many thanks for the great and very interesting article! It is important to remember the danger of even peaceful nuclear energy. Now everyone can visit the Exclusion Zone. Everyone in Europe should do it.